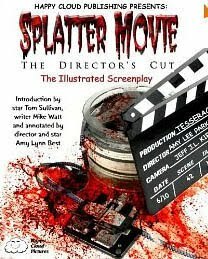 SPLATTER MOVIE SCREENPLAY - Official Website of Writer and Director Mike Watt (not the bassist, the other guy)! A film crew is being systematically stalked and killed by a someone posing as a character in the film. Soon, the lines between what is real and what is part of the movie begin to blur - before disappearing altogether! This is the original screenplay for the independent horror film from Happy Cloud Pictures, annotated and illustrated with dozens of behind-the-scenes photos.